Isa is the half-month stave through 13 December. Ehwaz is the intuitive stave, and Wunjo indicates a guardian’s message to us. Read right to left is Isa, Ehwaz, then Wunjo. I truly believe that #theweeklyrune includes the keys to making better choices based on keen insight into the present, to help each of us be more active in creating a better reality for us all. It means learning to tend what can’t just be fixed, and using every tool at our disposal to accomplish that. The runes are such a tool, and in the Old Norse tradition, this process is wyrdweaving at it deepest potential. The Weekly Rune is based on a three-rune cast. 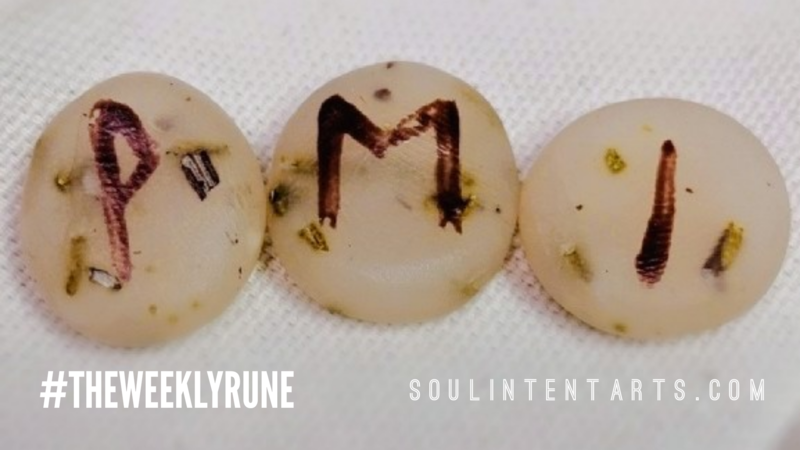 Those runes are the half-month, the intuitive rune, and the overview. The half-month is a set rune, which for the most part follows the traditional ordering of the Elder Futhark. The intuitive stave (meaning, I draw it blind) indicates the life force most available to us, to the focus of the half-month rune into sharper focus. It suggests how we can best handle the half-month energies. The final rune (also drawn blind) provides a high overview of the current time, and speaks from different voices. These voices are usually Nature, Earth, Creation, though are sometimes others. I note who’s speaking each week, as it is revealed. We really can’t ask for more benevolent runes this time of year. For the last few weeks we’ve been on a rollercoaster of figuring out how the external affects our internal, what we need to do differently about that, and trying to cope with the holiday pressure around it all. Isa is the rest rune. It’s the pause that demands something be given attention before anything else can move forward. Our mission in its season is to figure out what that thing is, give it the attention it seeks, so that we can be prepared for what comes after it. It isn’t that what comes after Isa won’t come. It will. The focus is that we be ready for it, which means using now to the best outcome. Helping us accomplish that outcome is Ehwaz, which serves as a wonderful reminder of who we really are and what were capable of. Ehwaz means horse, which carries many connotations in Old Norse culture(s). The one I’m focused on in this cast is the emphasis of the horse as the means of carrying one into ecstatic trance. There’s a great deal of overlap between Sleipnir, Odin’s eight-legged steed, and Yggdrasil, the World Tree, from which Odin hanged in ordeal to access the runes. For this week, realize that superficial isn’t going to cut it. The meat of the issue (whatever that is) is not going to be settled by mental, emotional, or physical prowess. It comes down to a very basic and grassroots engagement with the spirit(s) of our circumstance, and having the conversation(s) with them that guide us in what comes next. When I say the spirits of our circumstance, I mean very literally that we ask the spirit of the dynamic on our plate to come to us in trance and converse. Wunjo from the voice of Prosperity affirms the route of sitting with the spirits of our circumstance brings balance and beneficial outcome to all involved. 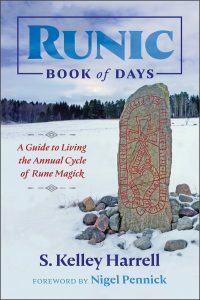 The rune of joy, Wunjo comes when all the elements of a dynamic are being properly addressed and tended, such that the outcome is realized in its time and closure is had. Wunjo is the state of woven wyrd revealing results that support and sustain (say that 3x, fast). Maybe it can be by accident or on a whim, though at least in this instance, Wunjo is the result of the work of Isa, done through Ehwaz. We don’t often get such a clear formula for how to tend ourselves to success. Heed it this week, so that we are ready for what comes next.